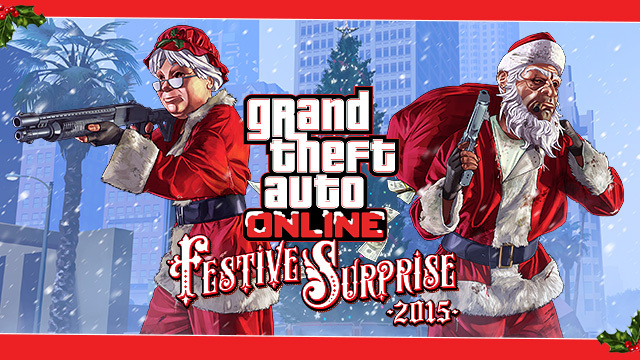 Festive Surprise 2015 is here! It started today and will last until 5th January2016 for PC, PS4 and Xbox One. 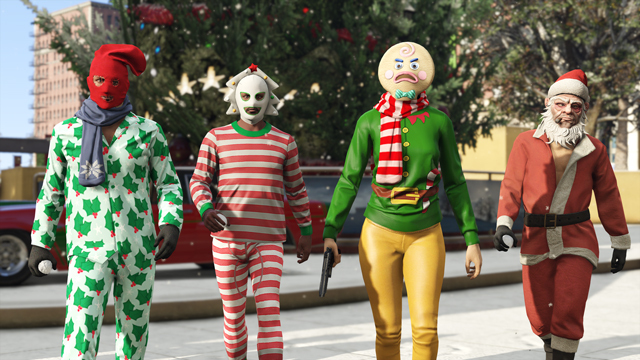 Keep an eye out for special gifts on all platforms during the holidays, including the chance for a few snowball fights during the rare phenomenon of Los Santos snowfall in the forecast as well as some special additions to the growing collection of fun Adversary Modes on PS4, Xbox One and PC. Post your best holiday-themed Snapmatic to Social Club between now and January 5, 2016, and our five most festive favorites will earn a GTA$1M award and also be featured at the Newswire. Make sure to tag your photos with #FestiveSurprise2015 on Social Club to be eligible. We are expecting a rocket launcher for firework at the end of the year. It has not been officially confirmed, but there has been found a mention about it in the game code.